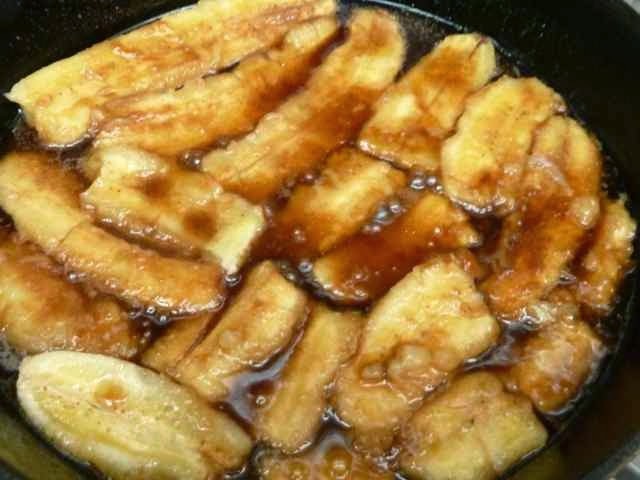 Here is another great way to use those extra very ripe bananas. A Tart Tatin is a traditional French apple tart. Basically, it is an upside down pie. The usual fruit is apple, but you can make it with just about any other fruit. The fruit is first caramelized in the pan on the stove top, cooked a while, then topped with a crust and finished off by baking it in the oven. One heavy skillet is used to cook and bake the pie. When done, the Tart Tatin is immediately inverted onto a serving plate. I used a recipe from Martha Stewart as my guide. You can use any pie crust you like. For a fast version, typically, a pre-made frozen puff pastry dough is used. In the gluten free world, as we currently know it, such an item is not for sale in any store and making puff pastry dough from scratch is definitely not a fast process. So, I decided to make a Pâte Brisée dough (French for Pie Crust) adding a little sugar to make it sweet. I made a Vegan/Dairy Free version as I knew some dairy free people would be having some. It came out absolutely delicious. Being a butter lover, I am pretty sure it would be even better if made with butter. I will just have to try this recipe with butter the next time to compare and see. I promise to update this post when I do make this again. 1 recipe Pie Crust for one 9-inch pie (see recipe below for Pâte Brisée). For Dairy Free/Vegan use margarine. In a large bowl add the flours, salt, xanthan gum and sugar (if using). Mix well. 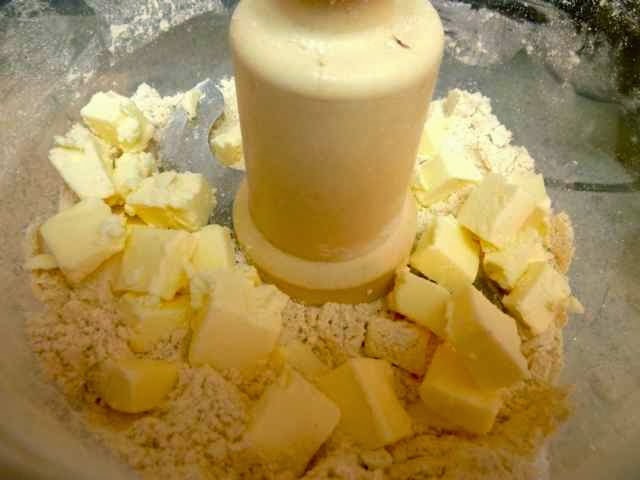 Cut the butter into small cubes and place in the bowl of a food processor. Butter (or margarine) cubes in the food processor with the flour mixture. Pulse about 10 times or until there are clumps ranging in size from some larger pieces about 1/2-inch in diameter to mostly sandy looking course crumbs. 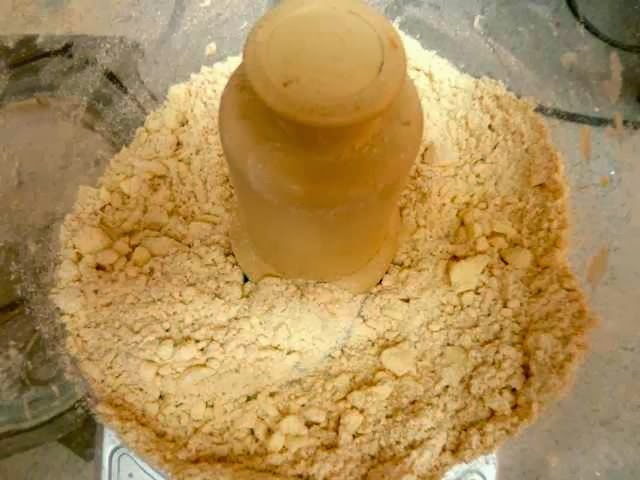 Flour mixture and butter or margarine after pulsing. Note the larger pieces and the coarse crumbs. 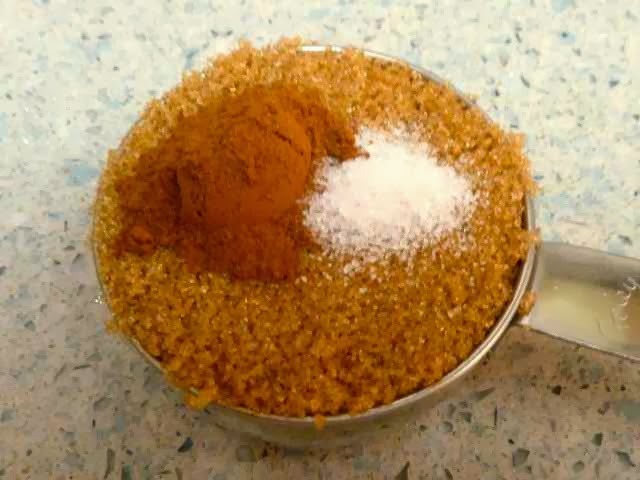 Pour this crumbly mixture into the large bowl. Add 3 Tbs. of cold water and stir gently with a fork. It should still look crumbly, but will hold together if you press some between your fingers. If the mixture is too dry add the additional Tbs. of cold water. It will still be a bit crumbly. Flour/butter mixture after the water is added and then mixed with a fork. Spread out a piece of plastic wrap on a counter. Pour the crumbly mixture onto the plastic wrap. Using the plastic wrap to help gather the pieces, press the dough together to form a ball. 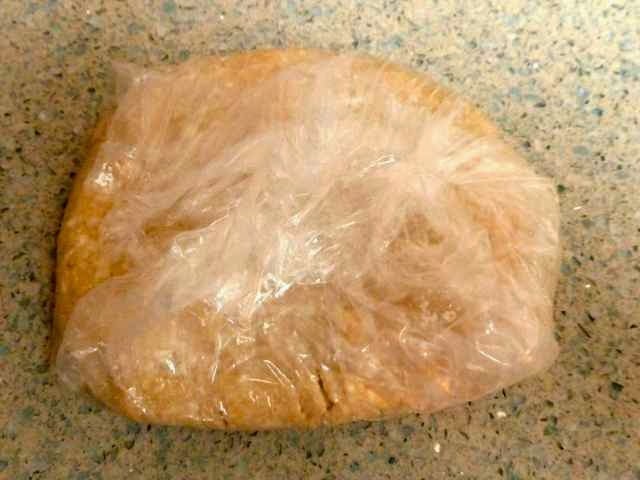 Crumbly mixture on a piece of plastic wrap. Ready to be gently pressed together. Flatten the ball slightly into a disk, wrap in plastic and refrigerate for 2 hours or overnight. 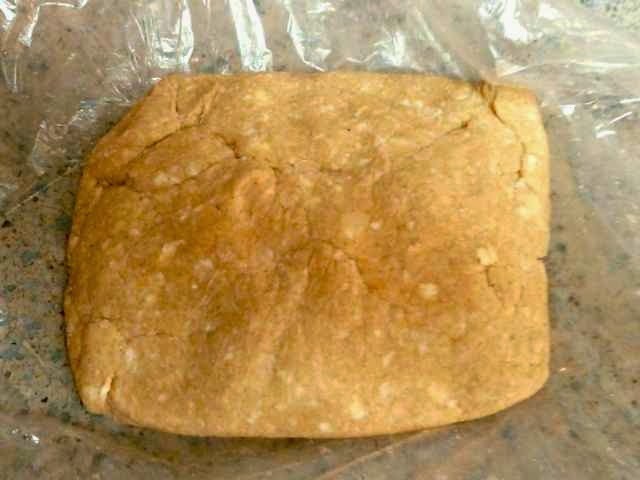 Dough after being gathered and pressed together. Dough after formed into a ball and flattened into a disk. Disk wrapped in plastic and ready to go into the refrigerator to chill for 2 hours. When ready to bake, preheat the oven to 425 degrees. 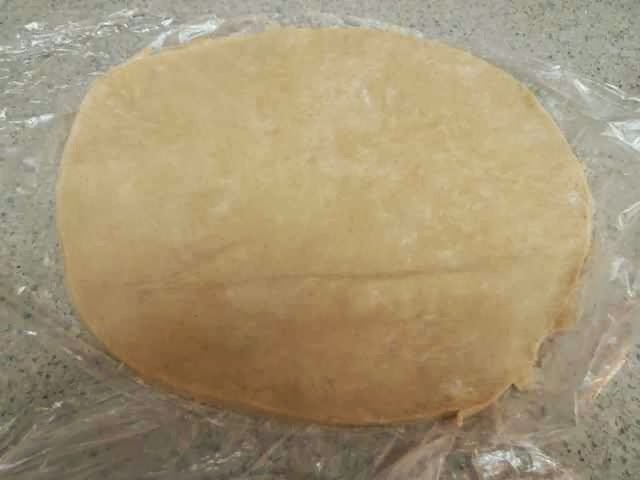 Dough disk rolled out into a circle between two pieces of plastic wrap. It is about ¼ inch thick and one inch wider than the skillet. Return the rolled dough circle to the refrigerator while you make the filling. 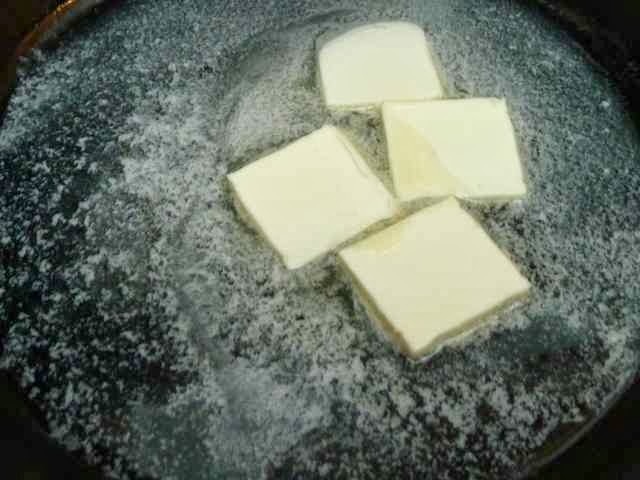 Over medium heat melt the butter in a 10 or 12-inch skillet. Make sure the skillet is ovenproof. Melting butter in a cast iron 10 inch skillet. Stir in the brown sugar, cinnamon and salt (if using). Cook and stir until the mixture turns amber in color (about 3-5 minutes). Sugar and butter or margarine cooked until it turns amber. Arrange the bananas, rounded side down, in the skillet. Cook about 3 minutes without stirring. Add the vanilla and cook another 1-2 minutes until the sauce thickens slightly. Remove from the heat. Banana after the vanilla was added. Cooking down in the skillet. 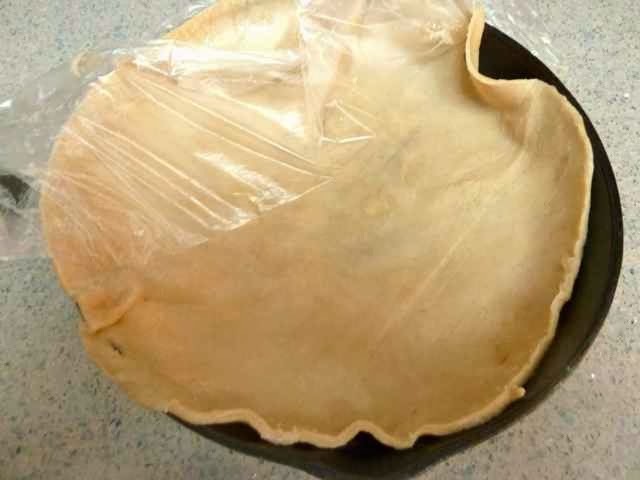 Take the rolled pie crust from the refrigerator. Remove the top layer of plastic or wax paper. Invert the pie crust into the top of the bananas in the skillet. Remove the remaining plastic wrap or wax paper. Pie crust inverted over the bananas in the pan. Plastic wrap is being removed. Gently tuck the crust in around the edges of the skillet. Cut a few slits in the crust to allow steam to escape. The crust tucked in around the edges. A few slits were cut in the center to allow the steam to escape. Bake until the pastry is lightly browned, about 25 minutes. Pie all baked and fresh out of the oven. Place a serving plate over the tart in the skillet. Using oven mitts, hold the skillet and serving plate together and then invert the tart onto the serving plate. 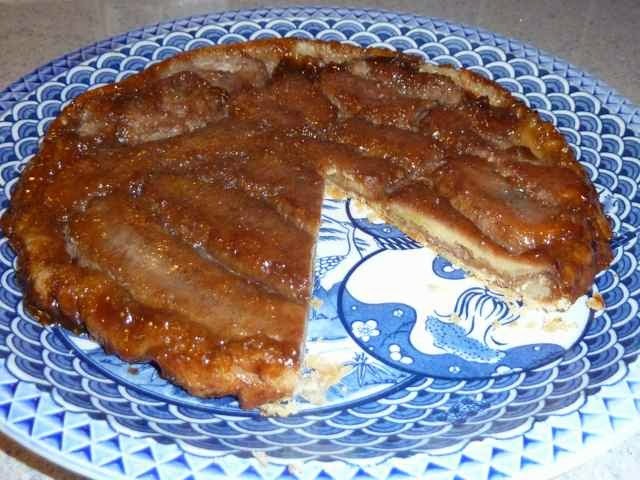 Banana Tart Tatin inverted into a serving platter. Remove the skillet. Use a spatula to scrape out any pieces of fruit that stick to the pan and then rearrange these pieces in the tart. 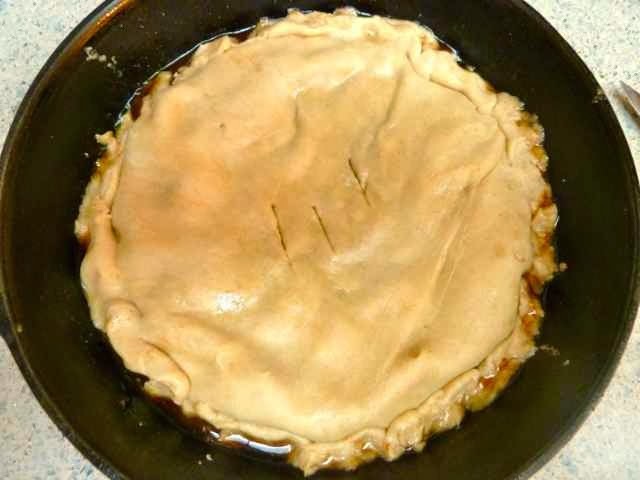 Scrape out any sauce that remains onto the tart. Serve warm or at room temperature. Freeze any pieces that are not consumed within two days. You can reheat any leftovers before serving. 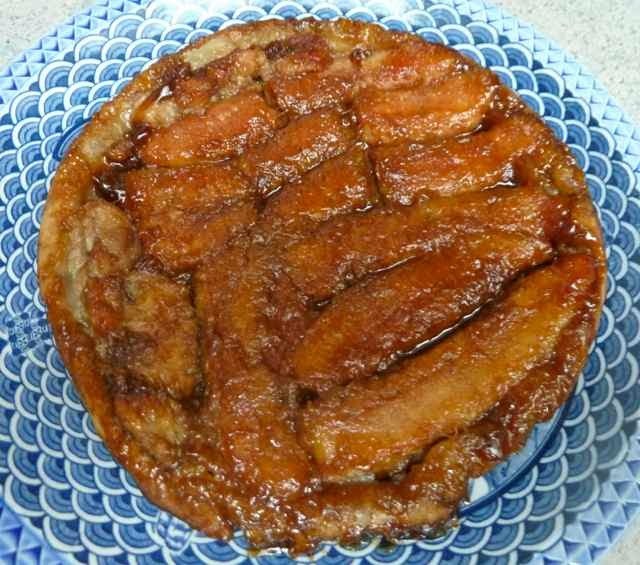 GLUTEN FREE BANANA TART TATIN Makes one 9-inch pie. Ingredients FILLING 6 Tbs. 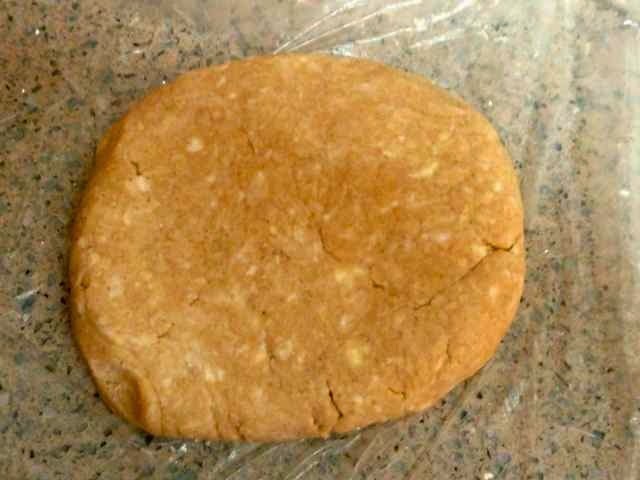 Butter (unsalted) or Margarine 1/3 cup Brown Sugar (packed) 1/2 tsp. 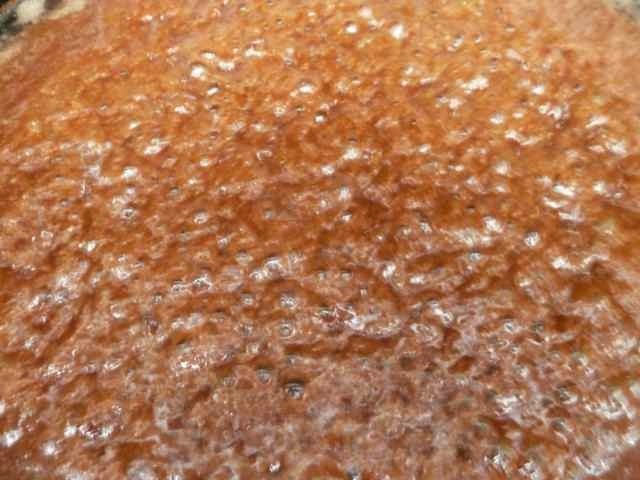 Cinnamon 1/8 tsp. Sea Salt (omit if using margarine or butter with salt) 5 large Bananas - peeled and cut in half lengthwise 2 tsp. Vanilla Extract 1 recipe Pie Crust for one 9-inch pie (see recipe below for Pâte Brisée). Gluten Free Pâte Brisée aka Pie Crust Makes One 9-inch crust Ingredients CRUST 3/4 cup Sorghum Flour 1/4 cup Tapioca Flour 1/4 cup Chickpea Flour 1/2 tsp. Xanthan Gum 1/2 tsp. Sea Salt 1 Tbs. Sugar (optional) 1 stick or 8 Tbs. or 4 oz. Unsalted Butter - cold For Dairy Free/Vegan use margarine. 3-4 Tbs. Cold Water Directions First make the crust. In a large bowl add the flours, salt, xanthan gum and sugar (if using). Mix well. Cut the butter into small cubes and place in the bowl of a food processor. Add the flour mixture. Pulse about 10 times or until there are clumps ranging in size from some larger pieces about 1/2-inch in diameter to mostly sandy looking course crumbs. 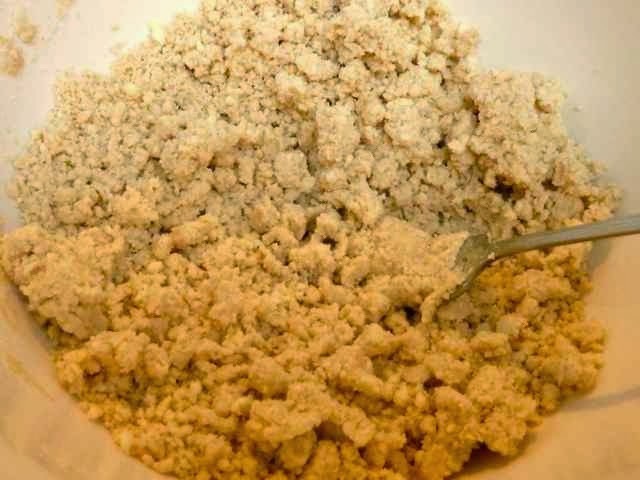 Pour this crumbly mixture into the large bowl. Add 3 Tbs. of cold water and stir gently with a fork. It should still look crumbly, but will hold together if you press some between your fingers. If the mixture is too dry add the additional Tbs. of cold water. It will still be a bit crumbly. Spread out a piece of plastic wrap on a counter. Pour the crumbly mixture onto the plastic wrap. Using the plastic wrap to help gather the pieces, press the dough together to form a ball. Flatten the ball slightly into a disk, wrap in plastic and refrigerate for 2 hours or overnight. When ready to bake, preheat the oven to 425 degrees. Roll out the dough to about 1/4-inch thickness. The dough circle should be about one inch wider than the widest edge of the skillet. (Gluten free dough is stickier than regular dough. It is best to roll it out between two sheets of wax paper or plastic wrap instead of using a lot of extra flour to roll it out on a board. The extra flour will make for a heavier and harder crust. 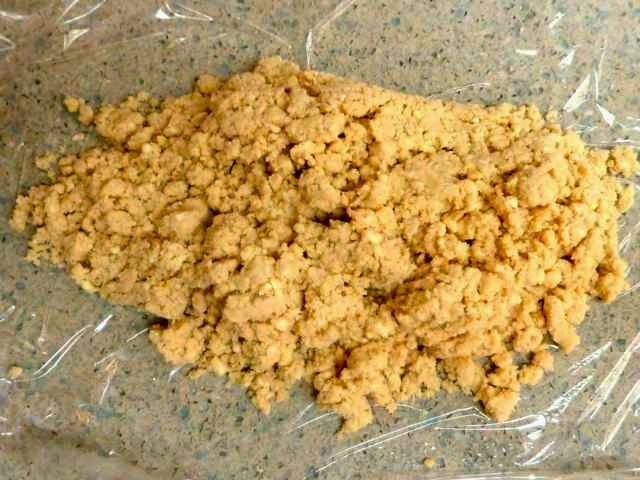 The plastic and wax paper have the added advantage of aiding in the transfer of the crust.) Return the rolled dough circle to the refrigerator while you make the filling. To make the filling: Over medium heat melt the butter in a 10 or 12-inch skillet. Make sure the skillet is ovenproof. Stir in the brown sugar, cinnamon and salt (if using). Cook and stir until the mixture turns amber in color (about 3-5 minutes). Arrange the bananas, rounded side down, in the skillet. Cook about 3 minutes without stirring. Add the vanilla and cook another 1-2 minutes until the sauce thickens slightly. Remove from the heat. Take the rolled pie crust from the refrigerator. Remove the top layer of plastic or wax paper. Invert the pie crust into the top of the bananas in the skillet. Remove the remaining plastic wrap or wax paper. Gently tuck the crust in around the edges of the skillet. Cut a few slits in the crust to allow steam to escape. Bake until the pastry is lightly browned, about 25 minutes. Remove from the oven. Place a serving plate over the tart in the skillet. 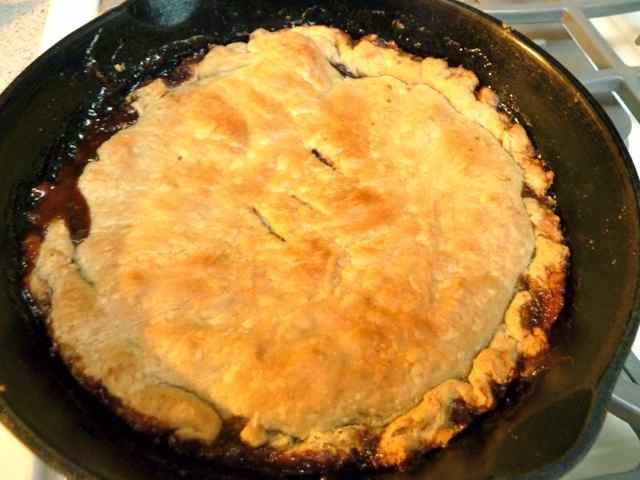 Using oven mitts, hold the skillet and serving plate together and then invert the tart onto the serving plate. Remove the skillet. Use a spatula to scrape out any pieces of fruit that stick to the pan and then rearrange these pieces in the tart. Scrape out any sauce that remains onto the tart. Serve warm or at room temperature. Freeze any pieces that are not consumed within two days. You can reheat any leftovers before serving. Are you going to try the vegan or butter version? No matter which one you make I hope you and your classmate enjoy it.